This is part one of The Divine Comedy. There is nothing funny about it. 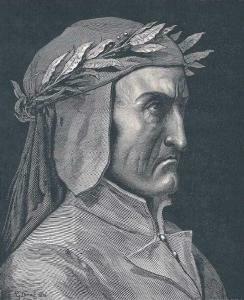 In Dante Alighieri's time, all poems were "high" or "low." A high poem meant that it was serious and sad. A low poem was a happy ending. These were often called comedies. Later, a comedy started meaning a funny story, but not is Dante's time. Nobody reads book 2 or 3 because they are happy stories. Everyone likes book 1 because we like to see other people suffer. 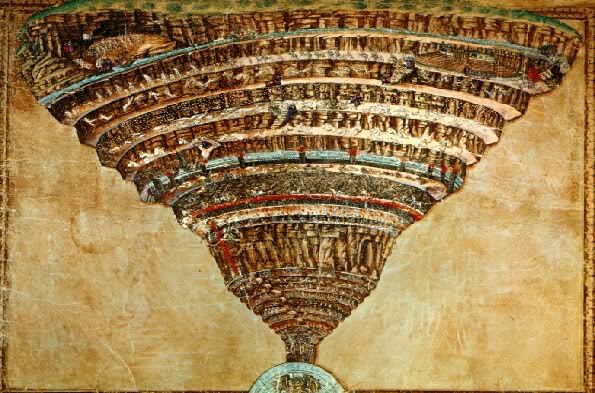 Dante spares no expense to make hell the most awful place in the cosmos. He put famous historical people and people he didn't like in hell. The book is broken into cantos. Think of a canto as you would a chapter. The Inferno is an allegory. An allegory is a story where pretty much everything is symbolic. All the punishments are symbolic in relation to the sin committed, the animals that guard the way back to the true path are symbolic of types of sin, the journey itself is symbolic of the acknowledgement of sins in your personal life. The number three, or multiples of it, is used frequently because it is the number of God. There are three books in the series. There are thirty-three cantos in each book (plus one introduction canto in The Inferno). There are nine (three times three) levels of hell. There are three main types of sins, represented by three beasts in the woods. There are three perfect ladies to inspire Dante. Get the picture. I'm not really done, I'm just stopping there for now! Not a happy looking guy. Dante lived from 1265-1321. That means that if we look at Dante the character being the same age as Dante the author, then this book takes place during the Easter weekend in 1300. When Dante is 6 years old, he meets Beatrice. In his mind, she is the most perfect girl in the world. His parents arrange a marriage to someone else, though. His mom dies when he is 12 and he eventually marries the girl that his parents had intended. Beatrice dies at age 20 and Dante always felt she was the one for him. His wife did not approve of this obsession over another woman. He writes about her quite often. Dante lives near the end of the Roman Empire and at that time, there was some problems between the Guelps (those who thought the pope had all authority) and the Empire (who believed that the emperor had all authority). 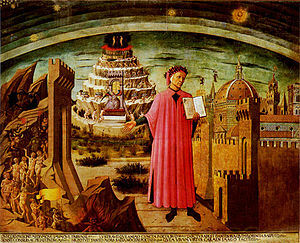 In 1302, the Guelps lose and Dante, who was a Guelps, is forced to leave his home in Florence. His wife, however, likes his home (it's rather rich and nice) and decides not to be exiled with him. Basically, it's what he gets for writing about how wonderful a woman other than his wife is. He writes The Inferno while in exile. Extra Credit - find out where this place is and what is going on here. E-mail me the answer. 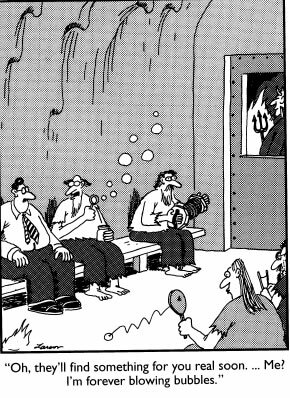 Punishments in hell are symbolic. Every punishment fits the sin. It's not just a simple, he cheated in school in life, so he will always cheat in hell. It's more complicated than that. Just take a look at the Opportunists. See the level of detail Dante goes to to show the symbolic nature. To use out cheating example, you could say that since cheaters only hurt themselves, in hell that's what they will do forever, stab themselves in the eyes. The Super Awesome Dante's Inferno Project!!! It must contain nine levels. What you choose to punish is all up to you. You can be serious or silly. It can be a theme (school hell, super villain hell, etc.) or all encompassing (like Dante's). The punishment must fit the sin in a symbolic way. This is crucial and is where almost all of the points will be coming from. Make sure that you write out each punishment and WHY it is symbolic (fits the sin). You can do it on the project or on the back or as a separate piece of paper. Make sure that it looks nice. You can draw your own illustrations or get someone else to help or cut them out of a magazine or print them out on a printer. I don't care as long as it looks good. MAJOR EXTRA CREDIT - if you are an artist, you can make a poster that can be displayed in the classroom that has all of Dante's nine levels. I want it to look good, though. This is only for those who really have artistic talent. 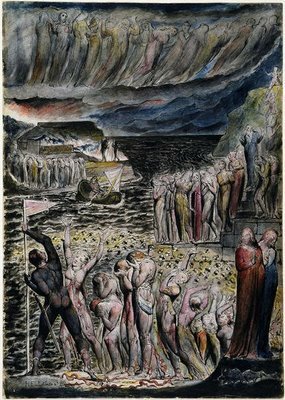 The World of Dante is a great site to visit for everything about the Divine Comedy. The Onion is a web site that makes fake news. They had an article on adding a new circle in hell and treated it as a business growth article. 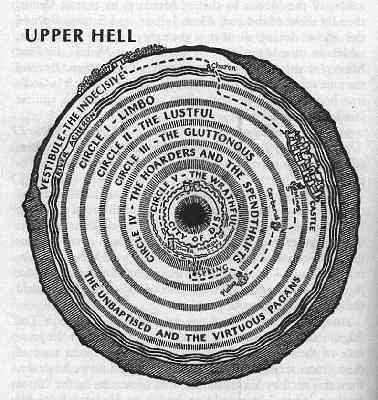 "Tenth Circle Added to Rapidly Growing Hell"
This is our introduction canto and technically does not count as one of the cantos for The Inferno (otherwise, we couldn't say that each book has 33 cantos). The symbolism here is over the top. 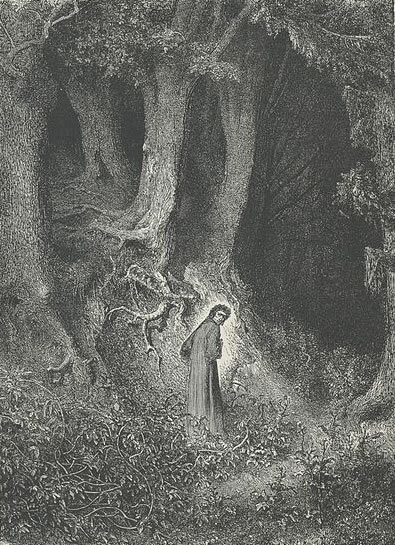 Dante is 35 years old and has gone off the True Path (the righteous life) and has gotten lost in The Woods of Error (mistakes made in his life). The sunrise (truth) shows him Mt. Joy (heaven), but he can't get to it because three animals block his path: a leopard (malice and fraud), a lion (violence and ambition), and a she-wolf (incontinence). He is in despair, but he is rescued by the shade of the poet Virgil (human reasoning). He says Beatrice (divine love) has sent him to lead Dante to Mt. Joy. But first, he must go through hell (acknowledge his sins), go through purgatory (renounce your sins), and finally go to heaven (experience God's love). Virgil says that he cannot go to heaven himself (he is not a Christian), but Beatrice herself will guide him. WERE MADE BEFORE ME, AND BEYOND TIME I STAND. These are the words that are inscribed on the gates of hell. 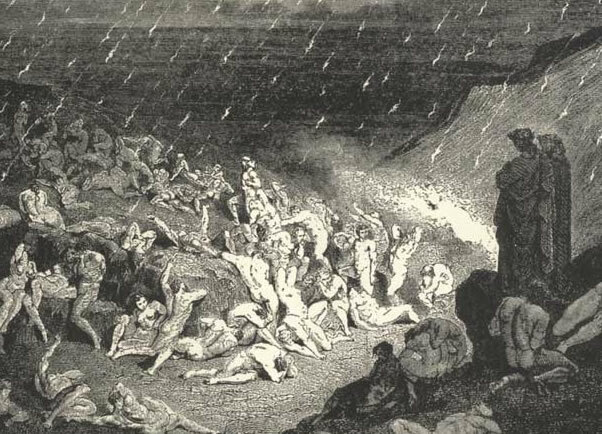 As soon as Dante is led through it, he is assaulted by the screams of those being tortured in hell. The most important thing about the gates is the last line inscribed on it. Once you enter hell, you know that there is no hope that you will ever leave. Compare that to the false hope on the gates of Auschwitz. The people in hell are so completely miserable because they have absolutely no hope. When Satan took on God, he had a third of the angels on his side. A third of the angels sided with God. That left a third who decided to wait it out and join up with the winning side. 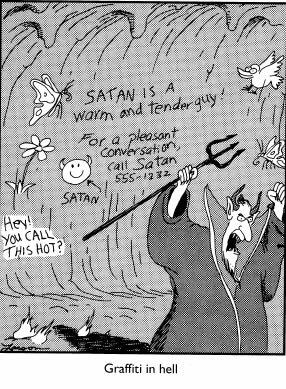 When God won, he cast Satan and his angels (now known as demons) into hell. The third that did not want to take a side tried to come over to God's side, but he kicked them out too. Satan will not allow them into hell, so they stay here in the vestibule of hell. Souls of people who also do not choose sides in life also end up here. The punishment for these guys is that they run in circles following a banner. Since they did not choose a side in life, the banner is blank. While they are running, wasps and hornets follow them. These bees represent their nagging guilt that pursued them for not choosing a side. They get stung repeatedly. The wounds from the sting ooze pus and blood that collect on the floor. Maggots squirm through the muck but the people continue to run through it anyway, ignoring it like they ignored taking a side in life. Dante recognizes one person, but does into give him a name. He calls him the one who made the Great Denial. This could be either one of two people. It could be Pontius Pilate, the Roman who sentenced Jesus to death, or Pope Celestine V. We do not know for sure since these losers have been stripped of their names. Charon is the ferryman of the souls in Hades in Greek mythology. Dante uses a lot of mythological allusions in his epic. 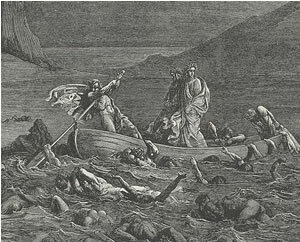 In hell, Charon ferries the souls across the river Acheron, the name of the river of woe that runs through Hades as well. There are multiple rivers i hell and they all flow somewhere. Where? Keep reading and we'll find out. 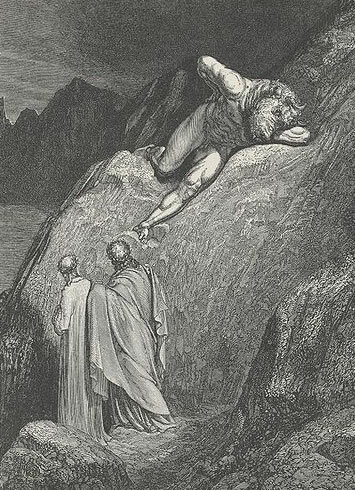 Charon does not want to let Dante pass since he is alive. 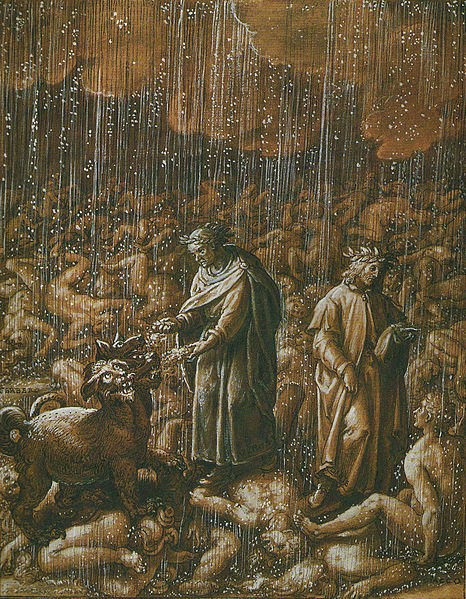 Virgil verbally smacks him down, calling upon heaven's will and Charon relents. Everyone is crowding to get on the boat to get across the river. Dante thinks this is odd since as soon as they get across, they will be eternally punished. Virgil explains that the damned are cursed to want to be punished. 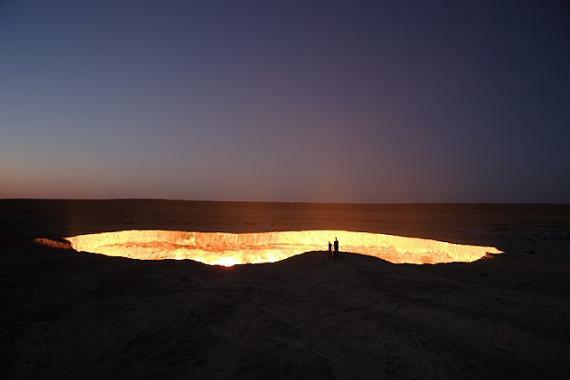 This is the first circle of hell - Limbo. Virgil lives here and he shows pity for these souls. He doesn't show pity for anyone else, but he feels that these souls are being unfairly punished. These are the souls who lived before Christ. Dante takes the viewpoint that you can only go to heaven if you believe in Christ. Since Virgil and the others did not who Christ was, having died before Christ's birth, they cannot go to heaven. The Old Testament people (David, Abraham, Moses, etc.) are not here. They used to be, but when Christ died on the cross, he came to hell, smacked around a few demons, and grabbed those guys to take to heaven. These souls lay around all day and sigh. Their punishment is never seeing God. Remember reading The Odyssey by Homer in ninth grade? Well Homer's chilling down here too. Dante is really happy to be here with all these great people. This shows that he doesn't quite understand his purpose yet. He has a lot of growing to do. 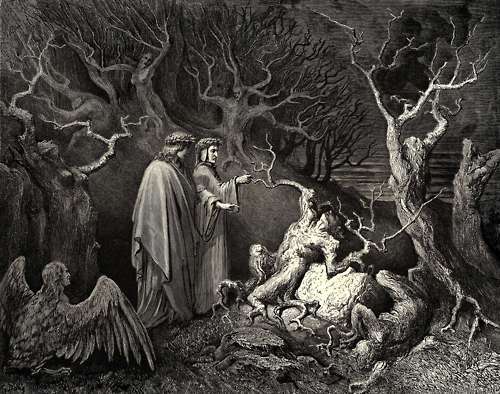 Here Dante and Virgil encounter the judge of the damned. 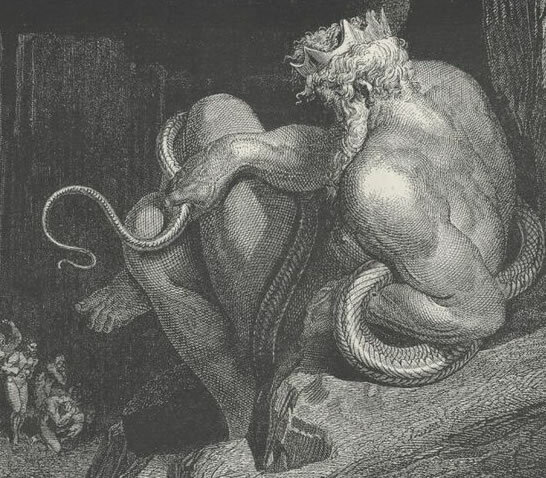 Minos is also the judge in mythology. He has a long tail. When a sinner comes before him, he wraps his tail around him a few times. The number of times the tail wraps around him is the level of hell the sinner must report to for their punishment. These are those who committed adultery and other perverse sexual acts. Here they forever punished. They did their deeds in darkness, so there is no light in this circle of hell. Plus, light represents reason and truth. There is no reason for these acts, so there is no light. They allowed their passions to whip them around, so for all eternity they are whipped by a windstorm. Dante sees some famous people in this circle. He sees Cleopatra, Achilles, Helen, Paris, Dido, and Semiramis. You can get extra credit by e-mailing me what Dido and Semiramis did to get here. Find the information somewhere other than the book. Dante hears the story of Paolo and Francesca. He feels pity for these poor souls, probably because he loved someone he was not married to. Virgil tells him it is wrong to feel sorry for these guys. 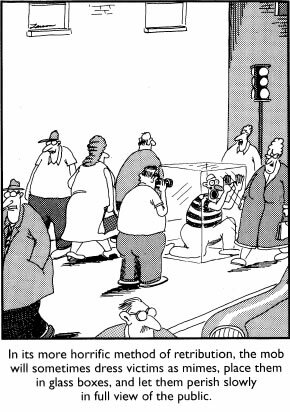 Gluttony is overdoing something, usually eating. Here we have a putrid smell and it is rainy. 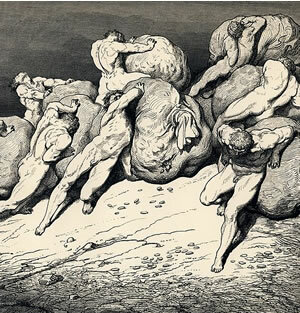 The gluttons lie here in pieces because Cerberus, the three headed dog that guards the gates of Hades in mythology, is here eating them. Virgil gets them by Cerberus by feeding him mud. The symbolism here is rather bland. Gluttony is a messy sin, so they are sitting in the mud and the smell is awful. They enjoyed overeating, so they they are a part of the process - the ones who get eaten. Cerberus is fat from feeding constantly. The Pluto (Roman god of the underworld and wealth) stands guard here. This is the circle of the Hoarders (those who kept their money) and the Wasters (those who spent their money too freely). There is no spiritual value in amassing large amounts of money or in spending it needlessly, so they do work in which there is no value. They push heavy rocks for no real reason. Charon took souls across the river Acheron. That rivers overflows and lands in this circle. It makes a marsh. This marsh is the beginning of the river Styx, the river of hate. It is a sin to act on your anger. These people were mean and spiteful in life. They spend all eternity fighting each other. That's pretty straightforward for Dante's symbolism. Dante notices air bubbles coming up in the marsh between people fighting. These are the sullen. They kept their anger in and never did anything about it. Their punishment is to be kept in. They are stuck below the marsh and can never come up for breath. They are constantly getting stepped on by the fighters. Heretics are those who don't believe and defy God. 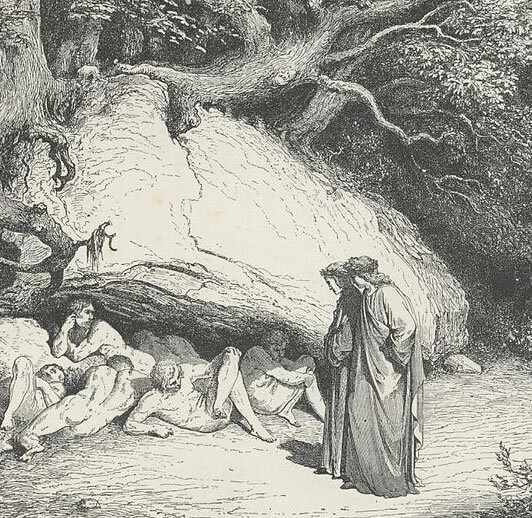 In Dante's case, he is particularly talking about those who do not believe in the resurrection. Since they do not believe that Jesus rose from the dead, they will remain in tomb forever. Because this is hell, the tomb is, of course, on fire. Dante sees quite a few people here. He sees a guy named Farinata who was in a group that was a political enemy of Dante's. They talk politics. He sees Cavalcante dei Cavalcanti, the father of a poet that was Dante's rival. He sees the tomb of Pope Anastasius II, a guy who tried to work with some people that believed that Jesus was either all human or all god, not both. What is the group of female monsters that try to kill Dante? Why does Virgil cover Dante's eyes? What saves Dante and Virgil? How are the heretics being punished? What happens to the tombs when Jesus returns? What does Dante say that makes Guido's dad think Guido is dead? The damned know the future, but not the ___. They can smell the nastiness of lower hell. It really stinks and they have to sit for a while to get used to it before continuing. How does the punishment fit this sin? How do they get across the river of blood? What happened to Pier Delle Vigne to make him take his life (he is the first suicide that Dante talks to)? For this canto, you only have to read the summary introduction. 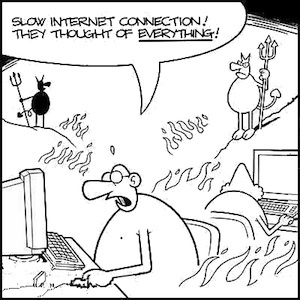 A usurer is one who lends money at an overly high interest rate. Who is the chief sinner of this place? Look up the chief sinner's name on Google or Wikipedia and find out what he did. The pictures that look like your little brother drew and colored them are also engravings. These engravings are by William Blake. He thought he was an artist. He was a much better poet. He made his engravings in a similar way that Dore did, except after he pressed it on the paper, his wife would color them for him.